Airline Seats who’s Chubby Now? There was a time when airline travel epitomizes luxury. The airlines offered champagne, comfortable seats, and offered a choice of beef, chicken or kosher meal included in the price of the ticket The seats were wide (even for my aunt Katie) and the service was casual passengers were well dressed at the airport. My mother insisted that I wore a suit with a bowtie. That was a long long time ago. Today passengers are treated like cattle. Seated in large staging areas and then funneled into narrow crowded tubes. There was a time in america when airlines competed for the comfort of passengers. Today, its all about profits there is little emphasis on comfort unless your willing to spend a few thousand on a transatlantic flight. Meanwhile in Economy one hundred and forty passengers have to share three restrooms. Back in the day, my mother insisted I wear my finest on the plane. Today, I travel in sweats and flip flops with a jacket that can accommodate my phone, tablet, back up charger and other electronics and books. In the October 2016 issue of Consumer Reports I learned,in 1985, average male traveler was 174 pounds, the average female traveler was 145.The average width of an Airline Seat in 1985 was 20 inches. Over the last twenty years the passengers have gained 20 pounds and the average width of the airline seat is smaller by 2.5 inches. Leg room shrank 2 inches. You can buy those two inches of leg room back if you purchase an “Economy Plus” or “Extra Plus. 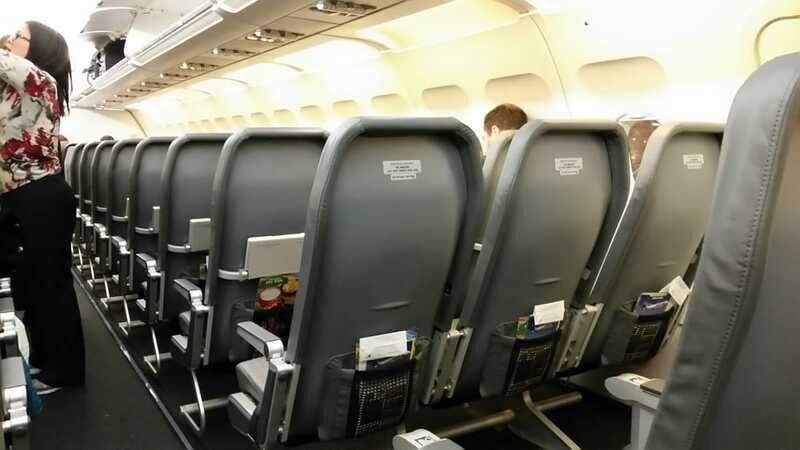 However should you purchase a ticket on an ultra discount carrier like Spirit, Frontier or Allegiant the seats could be smaller still with no options for an larger seat. Greyhound Bus an Amtrack passengers have considerably more space than Airline passengers. The Denver based ,Frontier Airlines used to be one of my favorite airlines. After the airline left Sacramento in 2013, I simply chose other carriers. Every week I would get Frontier’s Online deals from San Francisco. Phoenix and San Diego for $19. As I slept, Frontier became an Ultra Discount Carrier. Last April, I took Frontier up on their offer of a $19 one way ticket from San Francisco to Phoenix. I flew on Wednesday afternoon. a traditionally slow travel day. Frontier Airlines (what I remembered) the average seat was 19 inches wide and offered 31 inches of legroom. The last time I traveled on Frontier Airlines it was a discount carrier. In 2014,the airline became an ultra low cost carrier. Everything I knew had changed, seating configuration and fees. Even with the change, I thought I would was safe as most of Frontiers fleet consist of the Airbus 320, a plane known for its roomy seats. In addition to baggage fees, passengers are charged for carry ons for preassigned seating and more. I wasn’t prepared for the hard narrow seats I call inmate grey. According to Seatguru.com the average seat on Frontier is now 18 inches wide and they offer 28 inches of leg room. These seats do not recline (note the size of the tray table) They will comfortably hold your cell phone or a bag of nuts (at an extra charge of course). The travel time between Phoenix and San Francisco is ninety minutes. Within an half an hour breathing was difficult Even with an empty seat next to me, I could not get comfortable. Arriving in Phoenix, I needed an hour to recover from the flight. Some people experience forms of space anxiety in crowded space. Most Americans are obese and most airlines have addressed the issue by making even smaller seats. .
I’ve long accepted as an obese man (wedging 22 inches into 18 inches) and sitting in pain in a seat with insufficient leg room is just my price of air travel. I travel about 30,000 miles a year and I’ve only experienced Airline Anxiety three times in 20 years. I’ve recently learned through social media, I’m not alone, there are many people who are not obese, traveling in pain. Men over 5.10, some women over 18o pounds travel in one form of discomfort. Two weeks ago a friend was hospitalized after a flight from Los Angeles to Washington. He is 37 years old 6.2 and weighs 220 pounds. They found three blood clots, one in each leg and one in his chest. He travels more than 100,000 miles a year coast to coast. According to the Centers for Disease Control and Prevention (CDC). Cramped seating might increase the risk for blood clots (Deep Vain Thrombosis) usually in the legs. Especially on flights more than 4 hours long. They often dissolve on their own, but a serious health problem can occur when a part of a blood clot breaks off and travels to the lungs, causing a blockage—or pulmonary embolism—which may be fatal. Consumer groups are concerned about cramped quarters is that planes are too full for passengers to safely evacuate in the case of an emergency. As you read this Airline Companies are looking for way to add another seat to your flights. If your under 5.10 and weigh less than 170 pounds your good to go for Sept. By the holidays the airlines could introduce a folding airline seat. This entry was posted in NATIONAL and tagged Airline Travel, Anxiety, Frontier Airlines, United States. Bookmark the permalink.